Data Selection: Run a Linear Regression or an ANOVA on millions of data points. Available under the Modeling data menu. Test assumptions: Validate the hypothesis of normality and homogeneity of variances. Available under the Modeling data menu. Influence diagnostics: Compute DFBetas, Mahalanobis distance and other influence statistics. Available under the Modeling data menu. Variables characterization: Extra filtering and sorting options for a more customized output. It is also possible to use decimal weights in parametric tests. Available under the Describing data menu. Nonlinear regression: New interface and additional built-in models which can be used in various fields such as pharmacology. Available under the Modeling data menu. Scatterplots: Customize your graph choosing your own color for groups. Available under the Visualizing data menu. All the above features are available in all XLSTAT-solutions. Multiple Factor Analysis: You can now run this analysis on frequency tables such as count data of species. Available under the Sensory dataanalysis menu. STATIS: This method can be particularly used in the case of projective mapping, conventional profiling, free choice profiling. Available under the Sensory data analysis menu. DOE sensory: Improved designs for all sensory discrimination tests are now available. Available under the Sensory data analysis menu. Customer Lifetime Value: A new and useful feature to assess the financial value of your customers. Available under the Marketing Tools menu. Price Elasticity of Demand: Determine the price of your products at which the maximum revenue is generated. Available under the Marketing Tools menu. The last two features are available in XLSTAT-Marketing and XLSTAT-Premium. 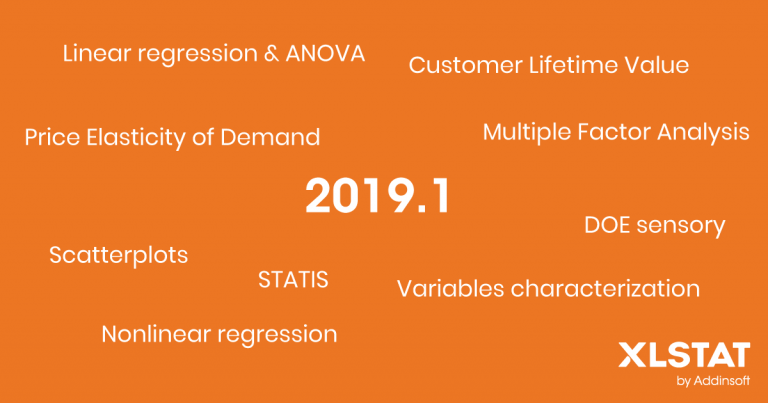 How to get XLSTAT 2019.1? If you have a perpetual license without access to free upgrades and maintenance, you can order an upgrade via the My XLSTAT portal. Otherwise, please contact us here.